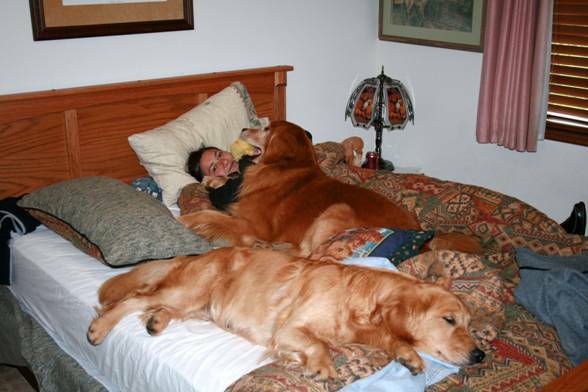 Click on the name of the dog to see its own page. ¡¡BOLA Y KELLY BECAME PARENTS!! We are happy with two precious babies! KELLY is a super mother and makes it brilliant, BOLA is very proud of his girls. They are Mini Bolas! Show, show, show! TRIP TO DENVER, COLORADO….!! 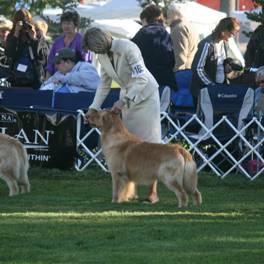 GOLDEN RETRIEVER NATIONALS! 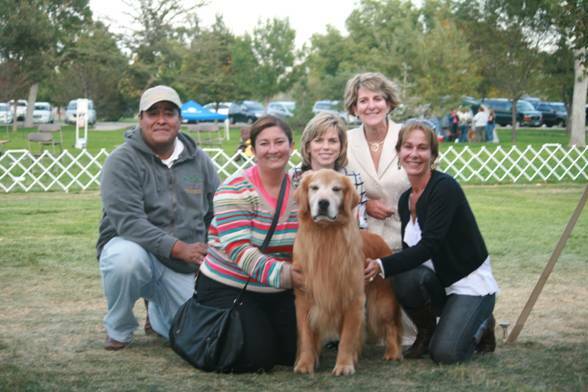 We were right on time in the Golden Retriever Nationals in Colorado. This is an event which we attend every year, where we meet with our breeder friends from other countries to share the passion and love that unites us. 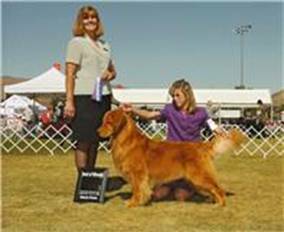 In 2010, as well as in 2009, the Best of Breed was for our beloved CHAOS, BIS BISS am CH Rush Hill Run'n Amuck at Abelard OA, OLA, AXP, AJP, NFP (SDHF OS). Congratulations!!!! We express our gratefulness and admiration to Tonya Struble, from the Rush Hill' s Kennel, who kindly handled and made shine our puppy OBI in the Golden Nationals. OBI is the son of BIS BISS a.m. Ch. 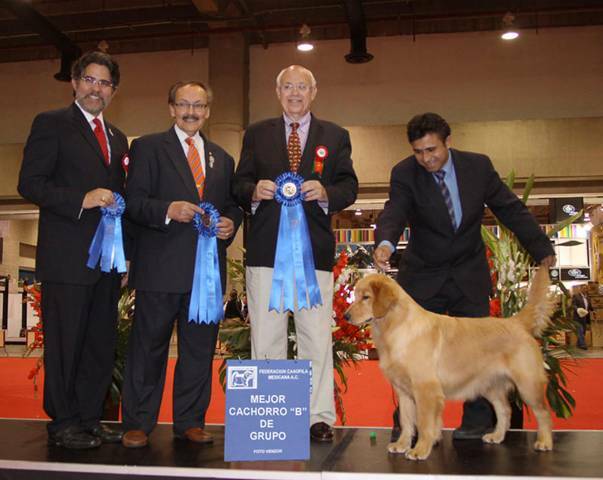 Summits Mr. Bojangles OS SDHF HOBO and our beloved SIMONE..
Garnev Golden Retrievers was present at EXPOCAN 70 ANNIVERSARY FCM SICALAM MEXICO 2010, which took place at the mos important International Centre of Exhibitions and Conventions of the country: World Trade Center, city of Mexico. 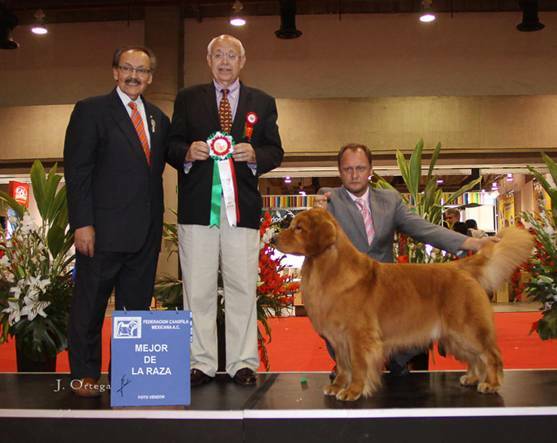 SICALAM is one of the most important shows for Latin America and our Goldens achieved wonderful results! BOLA WINNER IN SICALAM 2010 AND NEW MEXICAN CHAMPION! 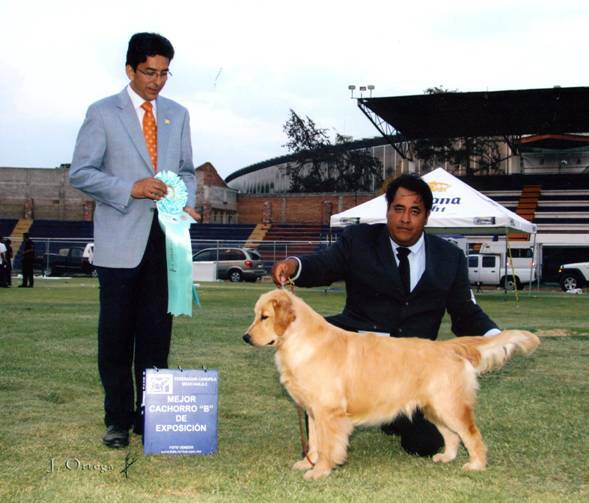 BOLA gets the title of Mexican Champion and, in addition, he is crowned as WINNER SICALAM 2010 under the rule of the prestigious American judge Mr. Ronald Menaker. OBI MEXICAN CHAMPION OF SICALAM. Our dear OBI, son of BIS BISS am ch. 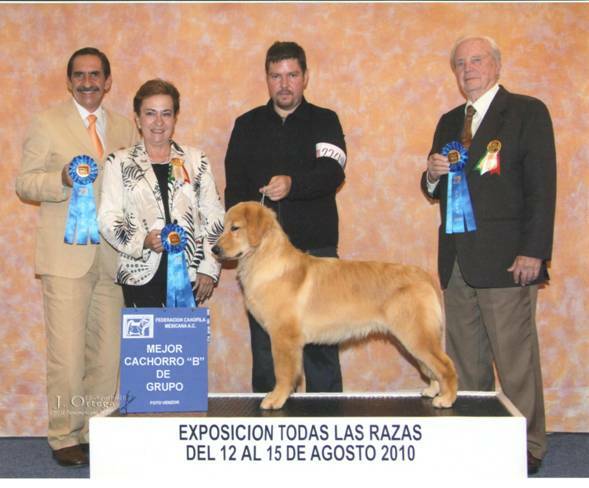 Summits MR. Bojangles OS SDHF HOBO and SIMONE inside of class 9 to 18 months, obtained a Mexican Sicalam Champion! 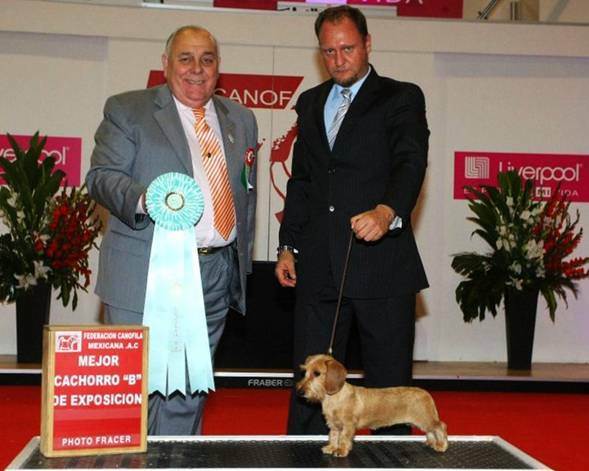 Thanks to his handler, and owner Gerardo OBI achieved the first of many Championships! RUSH MEXICAN CHAMPION OF SICALAM. Rush Hill's No More Drama RUSH didn't stop from shining in her debut show! Four appearances in the ring and four times Best of Breed Puppy and four times First in Group! Way to goooo! FLORENCIA WINS BEST IN SHOW!!!! FLORENCIA enchanted everyone with her great beauty! 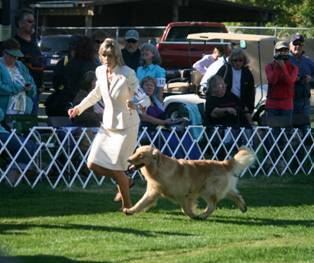 At seven months old, she won several times Best of Breed, as well as her Group. She closed her presentations getting two times Best Puppy in Show! FLORENCIA…. AGAIN…. WINS BEST IN SHOW!!!! 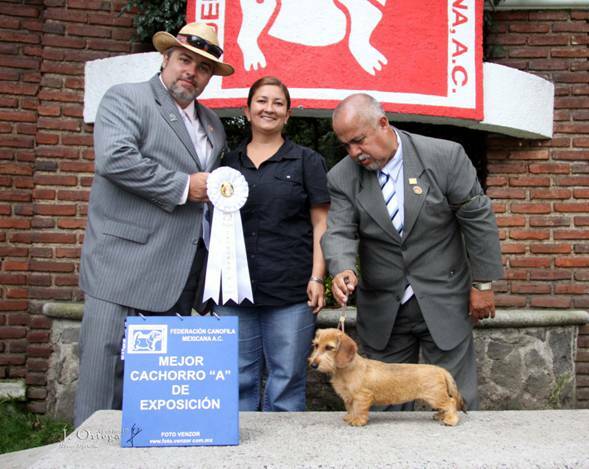 CASH (ANDY X MAY), in three appearances in the ring, achieves three Best of Breed Puppy B and three First in Group awards, while being exhibited by our friend Ernesto Pullin from Guatemala. CASH wins Best In Show! 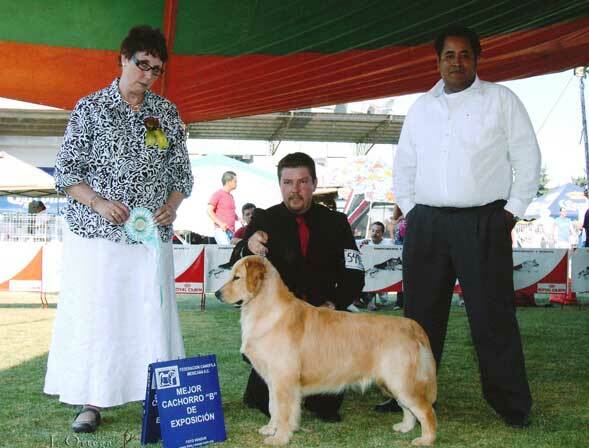 It could not have been another way… CASH wins BEST IN SHOW! Showed by his handler, breeder, and owner. CASH is son of the wonderful ANDY Am/Can CH. Chuckanut's Party Favour O´Novel, SDHF, OS, and MAY Can/Mex CH. JBG'S All The Way May. FLORENCIA WINS BEST IN SHOW!! Florencia, on her first day of exhibition wins Best In Show at the Club Mexico Argentino exhibition! The small girl successfully start her presentation at Mexico. 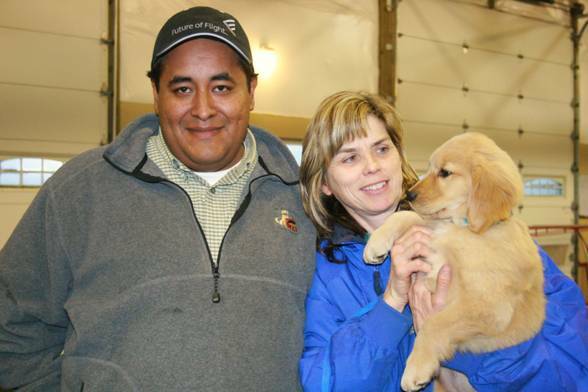 BOLA lands at Garnev Golden Retrievers!!! 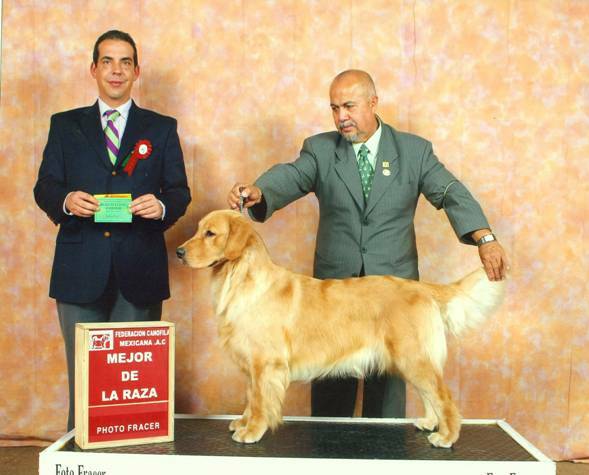 We are very happy to receive in our Kennel a wonderful dog, Best Young In Show, Young Brazilian Champion, Brazilian Champion, Grand Brazilian Champion and, if it were not enough, AMERICAN CHAMPION, his name is Goodtime's O'Brown Sugar, BOLA! 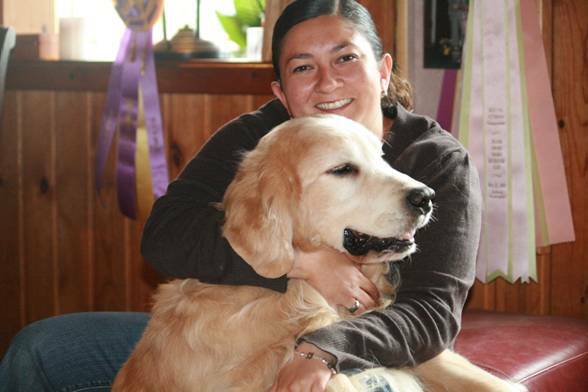 Thanks to Cecilia Branco, owner of Peterwhite Kennel and her partner Gervasio Milaneze BOLA will spend some time with us, improving the breed in Mexico!! Dear friends thank you for trusting in us and our work, undoubtedly BOLA is a unique specimen. A new, small baby girl arrives at our family from Spain: Florencia!! After a long trip from Europe, we hold in our arms this Daschshund Wire Hair beauty!!! Without any doubt, she will fill our lives with happy and unforgettable moments. Quique Boza, thank you for this little wonder. 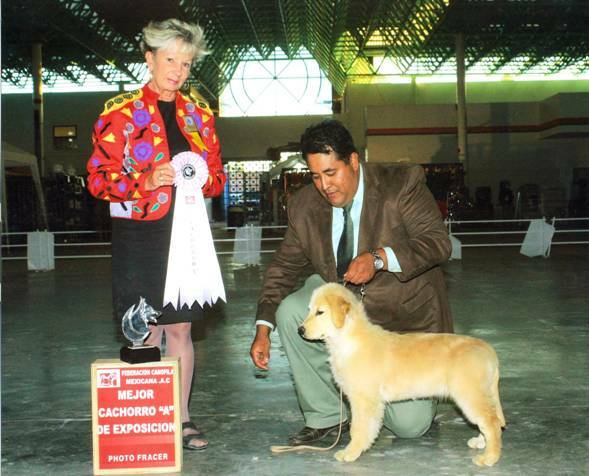 ROMINA, New Mexican and Pan-American Champion! 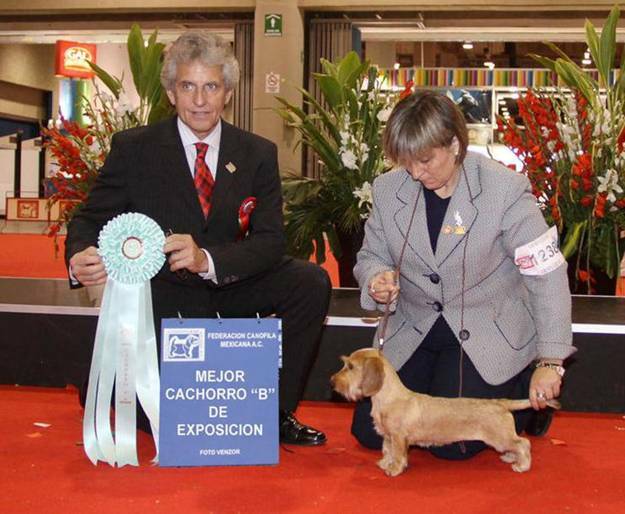 During Expo Can Guadalajara ROMINA (BRADY x SIMONE) completes her Mexican Championship and, as if it were not enough, her Pan American Championship, winning also Best of Breed under the trial of Judge Mr. Nicholas De Bedut Sknar! KAMIL wins Best In Show in specialty and Best In Show all breeds!!! 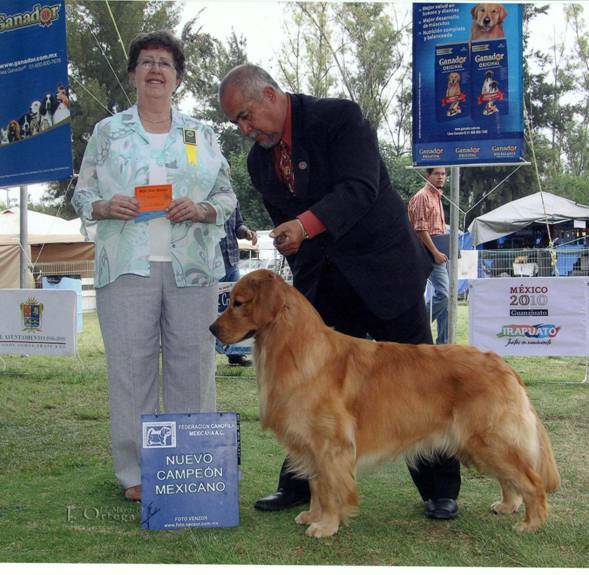 During the event of the Club Canófilo La Corregidora, the judge and Golden Retriever breeder, Mrs. Debbie Kahla, of the United States, carried out the judgement Golden Retriever support. 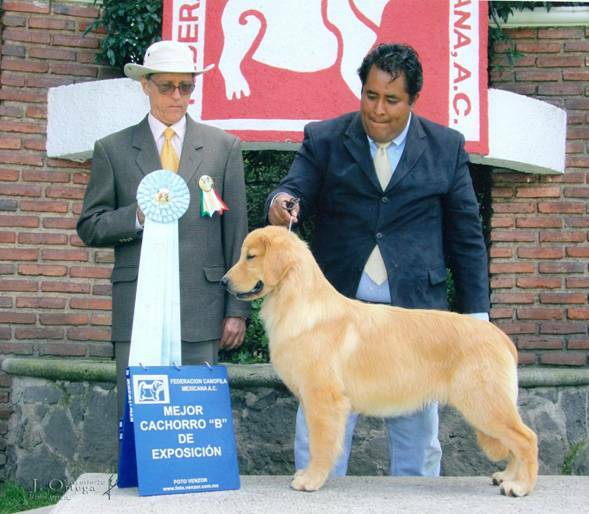 Our Kamil participated in the category of 6 to 9 months and was awarded BEST PUPPY B OF THE GOLDEN RETRIEVER SHOW! We proudly present our new Mexican champion!!! BONO ends his Championship in the show of the Club Canófilo Irapuatense. BONO is son of Brady Am/can. CH. Claddagh's Bronze Man and Simone. Bono will return to the rings in 2012. CASH on his first day on the ring as a puppy from 3 to 6 months…. wins Best In Show! We are confident that CASH has a successful path ahead! Keep going, dear Cash!! 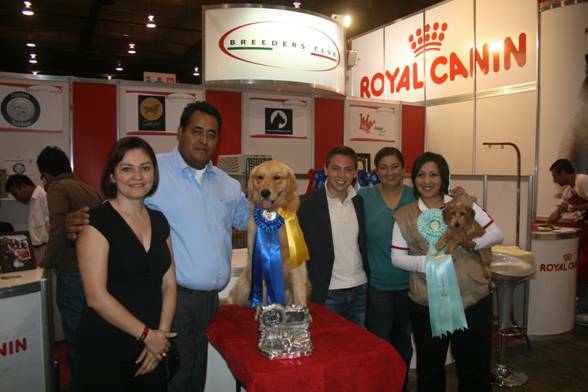 This success could not have been possible without the support of the owners of your dad "Andy" am/can CH. Chuckanut's Party Favour O´ Novel, SDHF, OS. RUSH… a dream come true!!! We are very proud to announce the arrival of our new baby Rush Hill's No More Drama RUSH… RUSH certainly is a dream come true! 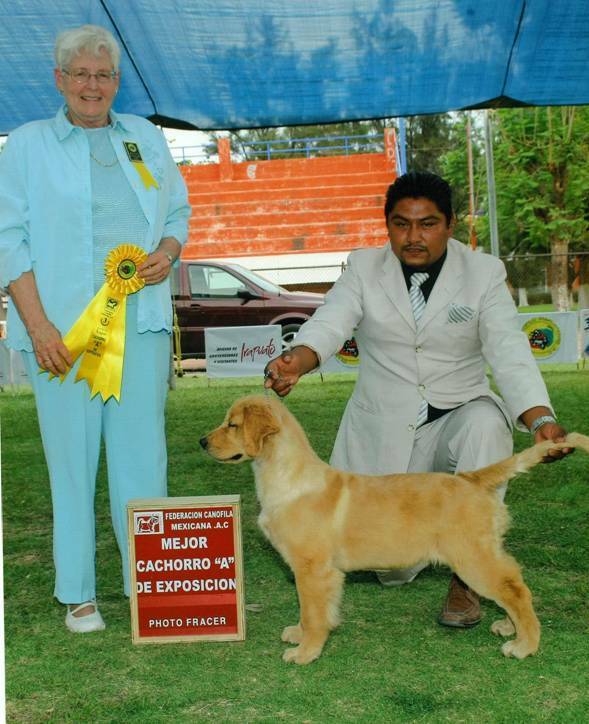 Thanks Tonya Struble for your charm, friendship, hospitality, our trip to know the snow, and for allowing us to be the first kennel in Mexico to have Rush Hill´s offspring … This beautiful baby makes us feel proud!!! We are sure that her parents CHAOS and DRAMA will always be very proud of this little wonder!! EXTRAORDINARY VISIT TO CHUCKANUT'S KENNEL! 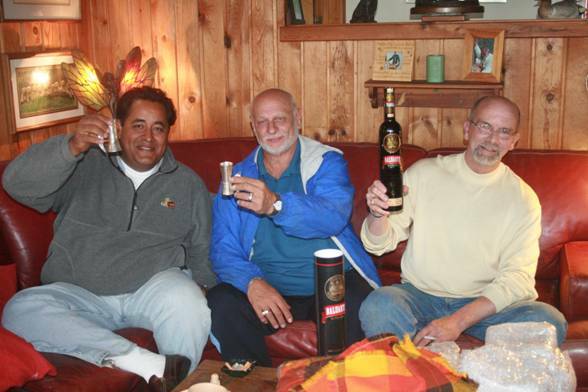 Thank you Ken Matthews and Wayne Miller for those unforgettable moments! It was great to know your home and your Golden family. ANDY is a wonderful Golden! Thank you for your support and trust. ANDY babies will soon shine in Mexican ring shows!! Welcome babies of MAY & ANDY!!! 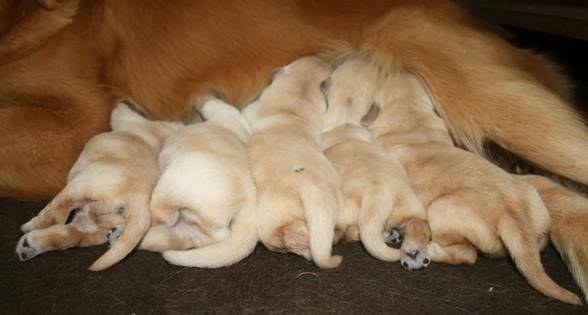 We started the year very happy for the births of 5 puppies: 3 females and 2 males!! The proud dad is Am/Can CH. 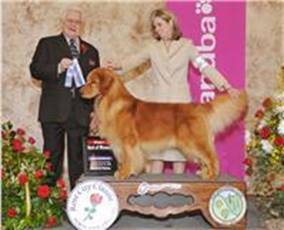 Chuckanut's Party Favour O´ Novel, SDHF, OS, first Golden to win the Sporting Group at Madison Square Garden in New York in 38 years. This litter is very special and important for us. It is the first time that Andy has offspring in Mexico!!! Thank you Ken Matthews and Wayne Miller, for all your support and trust! KAMIL wins Best In Show!! Our KAMIL, in her debut in the ring, wins BEST IN SHOW in the 3 to 6 months Class!!! 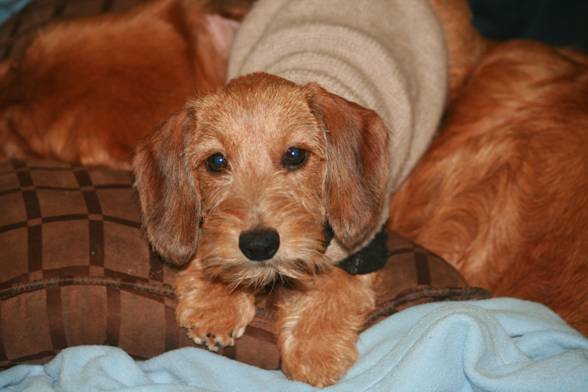 We hope Kamil to follow the path of her beautiful father: RUGBY, BISS am HCG CH/can CH. Gangway's SUV, SDHF, and her lovely mother JINX, am CH. FAERA'S APB. Thank you Becky Gang-Jordan for sending us to Mexico such a beautiful puppy!